WIN! €100 worth of NeoStrata Skincare! 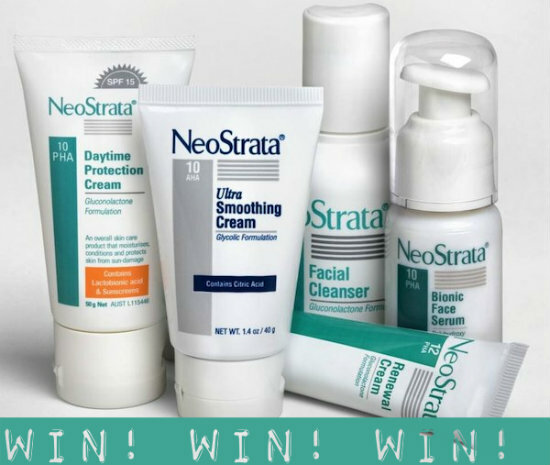 Cosmoceutical skincare experts, NeoStrata, know exactly what your skin needs to look and feel super soft and supple this winter and to help celebrate Fluff and Fripperies’ 2nd Birthday, NeoStrata have kindly given us a hamper of goodies worth €100 to give away! One lucky winner is really going to be the skin envy of all her friends! This amazing hamper contains all your daily skin care necessities such as Problem Dry Skin Cream, Eye Cream, Renewal Cream and Pigment Lightening Gel. If you're resident in the Republic of Ireland, get entering now to be in with a change to win this highly coveted prize. Good luck! Neostrata is available in pharmacies nationwide. For your local stockist information please see www.neostrata.ie. And to check out the rest of the open giveaways on the site, click here! We are spoiled with all these prizes!!! Really want to try start investing in decent skincare, this looks ideal! OOOOH I've wanted to try neostrata for ages, heard so many good things about it! I'm only dying to give this stuff a whirl. amazing prizes love this brand!! Fab prize, count me in please! Aw Emma!!! You're really spoiling us!